In our previous Blog, we talked about the human element being one of the foremost critical factors during an ERP implementation within a manufacturing setup and why it has the potential to derail or propel the success of the implementation. We also mentioned that involving the employees based on their strengths is the biggest morale booster for them, and their buy-in towards an ERP implementation becomes quicker and easier. 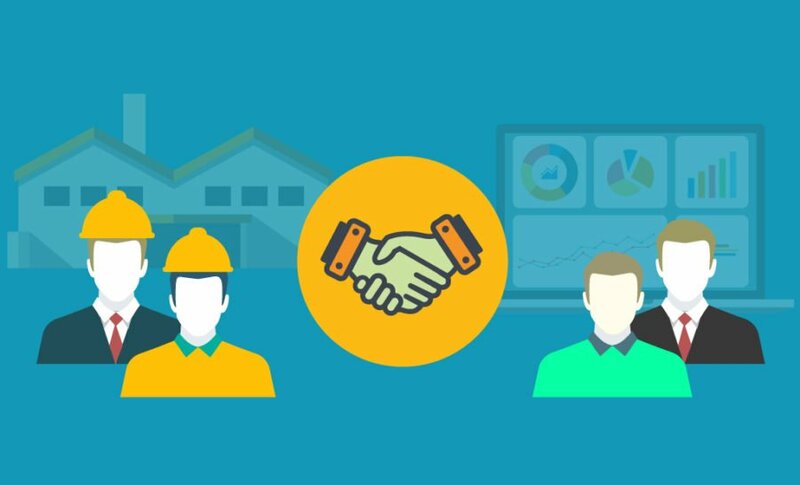 The involvement of the ERP vendor and their staff is equally critical as they would be interacting, working with the manufacturing personnel every day, and the implementation success depends on the camaraderie between them. Today, we will emphasize on how manufacturers can leverage their internal resources to efficiently work with ERP vendor’s implementation resources to ensure a successful implementation. Why not an ERP consultant? Some would suggest that hiring an ERP consultant is the best way out, as he/she will have the requisite knowledge and experience of implementing ERPs in various manufacturing organizations belonging to varied industries and segments. Plus, the consultant will have varied skill sets such as project management, people management, conflict management, ERP and industry domain knowledge etc. A valid point but hiring an ERP consultant comes at a considerable cost to the company. You might argue that this would be a one-time cost that the manufacturer has to bear till the implementation is over. However, SME manufacturers usually have to deal with tight budgets and operate on limited margins. Apart from the ERP cost, infrastructure changes, employee training, production changes etc. owing to ERP implementation, an additional cost of an ERP consultant can put additional burden on them. Your staff knows the end to end of your manufacturing business and daily operations. They are well versed with business processes, manufacturing workflows, and are very capable to provide critical insights towards the implementation. Being the masters of their profession, they would have clear insights on the results they want to see within their respective work-areas and whether the ERP software achieves them. Also, the news of the implementation usually deflates employees’ confidence levels and therefore, involving them in the project gives them a sense of importance, a common mission towards a single goal. They learn about the ERP, thus making them realize how it would make their lives easier and enable them to learn new technology and knowledge. And finally, they will be in a better position to take up their new roles if they have been slated to change due to the implementation. Once you have decided to bring your employees on board the implementation team, the first task is to identify the right candidates who belong to various departments in your manufacturing organization and have requisite knowledge of respective processes. The criteria of choosing your candidates would be based on their expertise, experience, and various skill-sets such as people management, project management, conflict management, quick-learning, interaction etc. Once the team is assembled, the next task would be to distribute responsibilities to the team members and ensuring each person is accountable for their respective targets/achievements. Target or achievement here would be the successful implementation of a specific ERP module as per their department requirement. Supervising Executive – overseeing the entire implementation and validating key decisions made by the rest of the team. The executive will constantly interact with the ERP vendor’s management team to get regular project-level updates, oversee & approve financial and contractual agreements etc. Process Experts – who ideally come from various departments and are experts in their respective department operations and business processes. They will have the responsibility of ensuring that the ERP software is properly implemented within their department to meet specific requirements. They will ideally interact with the ERP vendor experts to automate existing business processes and operations. Project Manager – The implementation usually involves multiple departments, personnel and liaising with ERP vendor over a set period of time. Therefore, to ensure that the project runs smoothly and there are no delays, assigning the roles of a project manager to the best-fit resource is absolutely vital. The concerned employee should be able to coordinate with multiple stakeholders and lead periodic status meetings to track key deliverables and decisions. He/she would be responsible to create an implementation plan filled with achievable milestones, detailed expectations and realistic deadlines. The plan would encompass various responsibilities to individuals/teams and who will do and achieve what in higher detail. The manager will have to ensure that all the activities are conducted by the chosen team with clockwork precision and results will be tracked for greater responsiveness to any unseen issues that might crop up during implementation. Constant tracking and correction measures will speed up implementation and also increase its effectiveness manifold. SME manufacturers do not have the luxury of having a big staff count. Many times, roles and responsibilities are overlapped between individuals and they also rely on external resources to do the job for them. One advantage of being a SME organization is the implementation process won’t take long as the overall operations are small and concerned stakeholders are less. But still, the employees will have to do a balance act of handling daily operations and carry out new responsibilities under the ERP implementation. This is like changing the wheel of a car in motion. It might happen that the executive supervisor acts as a project manager and also a process owner of his respective department. The ERP vendor will be working with your team from Day 1 of the implementation. Therefore, it’s necessary that they have a formal introduction with each other and get acquainted before getting down to business. ERP vendors usually have a team responsible to interact with the manufacturer’s various point-of-contacts based on their expertise and operational targets. Therefore, getting to know and clarifying various assumptions, implementation approach, timelines etc. will provide immense confidence and clarity to the team. How can the ERP Vendor help? The ERP vendor has all the capability of hand-holding the manufacturing organization and their implementation team towards a successful implementation. They know the industry as they have worked with numerous organizations from varied industry segments to implement their ERP software. They can use this experience to hand-hold the implementation team in the pre-implementation, implementation and post-implementation phases. The pre-implementation phase would involve conducting a gap analysis that would outline various shortcomings in computer software/hardware, personnel skills & expertise etc. These would be addressed to the manufacturer who will then take steps to meet them. Also, the vendor will undertake detailed training for the manufacturer’s implementation team and key personnel who would be working on the ERP. Post training, they will test the ERP in a closed testing environment with the manufacturing personnel. They will test the system in real-time and provide critical feedback on the operations and any detected issues. After all the issues are ironed out, the vendor will then implement the system throughout the manufacturing organization. Post-implementation issues will be handled through regular meetings, webinars etc. and hand-holding of the staff would continue as per the contractual agreement. There are many instances where post-implementation and training, the manufacturing organization slowly slip back to their earlier working methods as it is more comfortable for them to do so. Even though the ERP is present and functioning within their organization, many manual processes creep into the new workflows and slow down the overall operations. One of the critical role of the implementation team is to ensure the ERP’s Return on Investment (ROI) is high and the operating personnel get used to it so much that they can’t do without it. This depends on proper hands-on training of personnel on the software and on-the-job run-ins that will give them the confidence to handle technology effectively and feel its positive impact in their day-to-day work and results. Also, the understanding of the impact the software has on the overall efficiency of the organization. Faster production means more sales and reputation leading to growth and expansion. Large manufacturing organizations have the budget, the time, a big team of implementation and technology experts to endure prolonged ERP implementation within their multi-facility organization. Whereas, Small & Medium enterprises do not have that luxury. For them, time and money are of great essence and a decision to implement an ERP is taken after a lot of brainstorming and discussions with various internal stakeholders. There will be a lot of apprehensions, fear, uncertainty etc. over how the decision would pan out. Hiring a consultant would be out of question but at the same time very tempting. In this situation, trusting your own manpower and leveraging the expertise of the ERP vendor will be your best bet. Yes, you and your employees will have to juggle both normal business operations and implementation tasks at the same time. It’s easier said than done, and Time Management will be the key. But you will have the support of your ERP vendor who has all the expertise and experience to take you through a successful implementation.